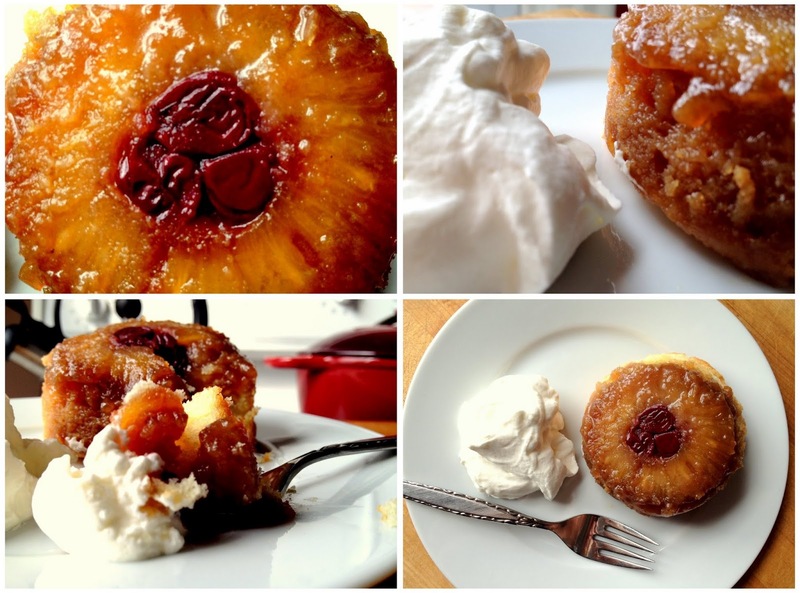 Should you bring these individual pineapple upside-down cakes to the office potluck, Mr. Draper may want to see you in his office and ask you huskily to close the door. In the spirit of Mad Men's return and inspired by a post by my blogging friend Jen from Juanita's Cocina, I've reinterpreted this retro dessert table staple into a single-serving mini-cake that has the ability to unfasten garters and deliciously fill out pencil skirts with its caramelized bottom. Paired with a mound of coconut whipped cream, these little cakes are comfortingly dense and undeniably seductive. For me some of the biggest joys of making food are the surprises inherent in certain steps of a recipe: the moment when sugar and butter cream together, the way egg whites whip stiff, the way you 'hide' a ring of pineapple and cherries in butter and sugar at the bottom of an otherwise unassuming batter. I love the sweet surprise of turning it over to find fruit intoxicated by caramel that has seeped its way into the rest of the cake. I wanted to freshen the flavour of the cake, so opted for slicing thin slices (about 1/4") of fresh pineapple and cutting them to size with a biscuit cutter to fit the bottoms of my ramekins. Equal amounts of brown sugar and butter are distributed into the bottom of the ramekins and placed in a preheated oven to melt. 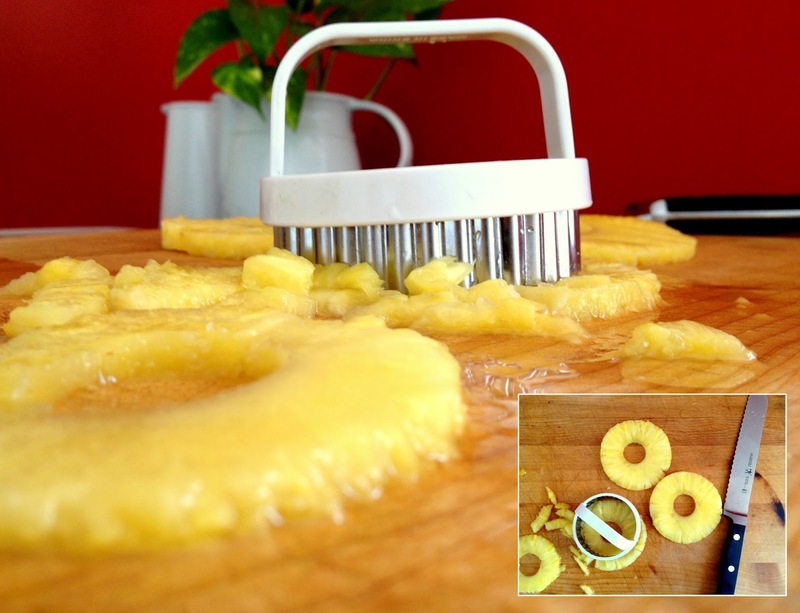 The pineapple rings are then carefully draped on top of the hot sugar/butter mixture and some sour cherries (I'm not a fan of the more typical maraschino) fill in the middle of the rings while others conveniently find their way into my mouth, for 'testing.' Butter and sugar are creamed together, eggs are added, followed by flour, buttermilk, and coconut and vanilla extracts to form the cake batter, which is carefully scooped on top of the fruit and caramel. The trusty ice cream scoop helps to distribute the batter evenly - I found two scoops was the perfect amount for each ramekin. The cakes are sent to the oven to bake until the tops are golden and an inserted toothpick comes out clean. It is a good idea to put your ramekins onto a cookie sheet, as some of the caramel may spill over and make your house smell like a confectionery. The recipe I followed for the cake batter makes enough for one large (10") skillet or 8 ramekins. 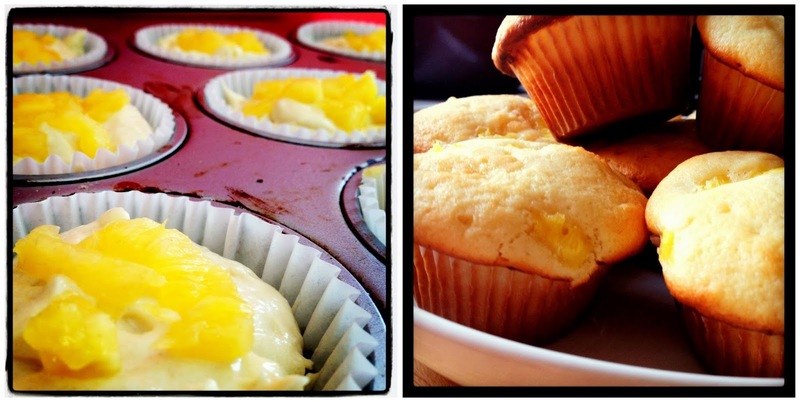 I only have 4, so I used the remaining batter and pineapple edges to make muffins, as documented via Instagram (feel free to follow - @kitchen_boudoir). Pineapple and cherries glisten with caramel atop a dense, buttery cake served alongside soft clouds of tropical whipped cream (cream with sugar and coconut extract). Individual Pineapple Upside-Down Cakes - adapted from Jen at Juanita's Cucina via The Unofficial Mad Men Cookbook: Inside the Kitchens, Bars, and Restaurants of Mad Men. Distribute butter and brown sugar evenly among 4 ramekins set on a cookie sheet- place in preheated oven until butter and sugar melt together and bubble slightly - about 5 minutes. Remove from oven and carefully place individual pineapple rings on top of sugar/butter mixture in each ramekin, filling the centre of the rings with sour cherries. 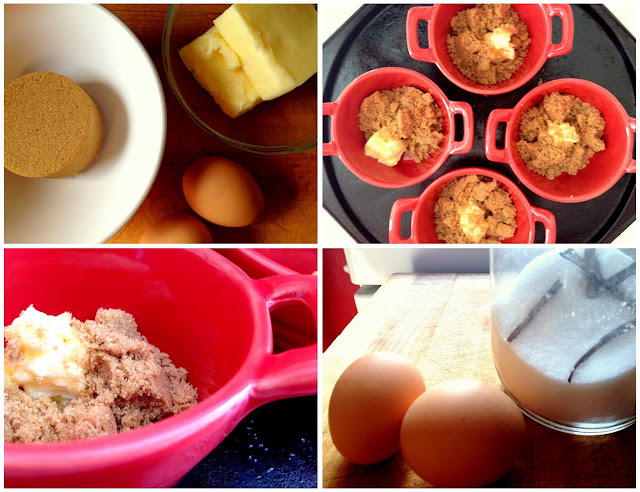 For batter, cream butter and sugar until light and fluffy. Add eggs, one at a time, beating till combined. In a separate bowl, mix flour and baking powder. Combine buttermilk, pineapple juice and vanilla and coconut extracts in an additional bowl or measuring glass and pour into the butter/sugar/egg mixture, alternating between liquid and dry ingredients and mixing until combined after each addition. 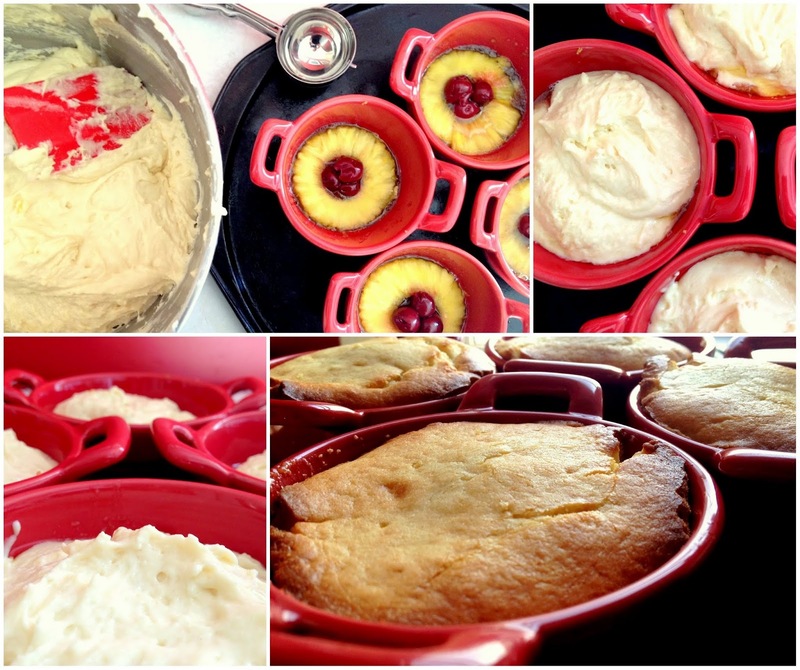 Distribute batter evenly among 4 fruit-lined ramekins, to about 2/3 full and place in oven until tops are golden brown and an inserted toothpick comes out clean - approximately 35-40 minutes. Serve with coconut whipped cream. Chill bowl and whisk before using. Whip chilled cream and extract slowly adding sugar until desired consistency, careful not to over-whip. The remaining batter is great for additional upside-down cakes if you have enough ramekins (simply double the topping amounts) or is deliciously transformed into pineapple-topped muffins (I used the edge trimmings of the pineapple rings I had cut to fit the ramekins). If you do not have ramekins, simply make the cake in a 10" skillet or cake pan with additional slices of pineapple and cherries and double the topping amount. This cake tastes like watching Mad Men feels - you simply cannot stay away, each bite leaves you wanting more and you are sad when it's over. these are so cute and sound super delicious! Exactly! I like your logic, Amrita.